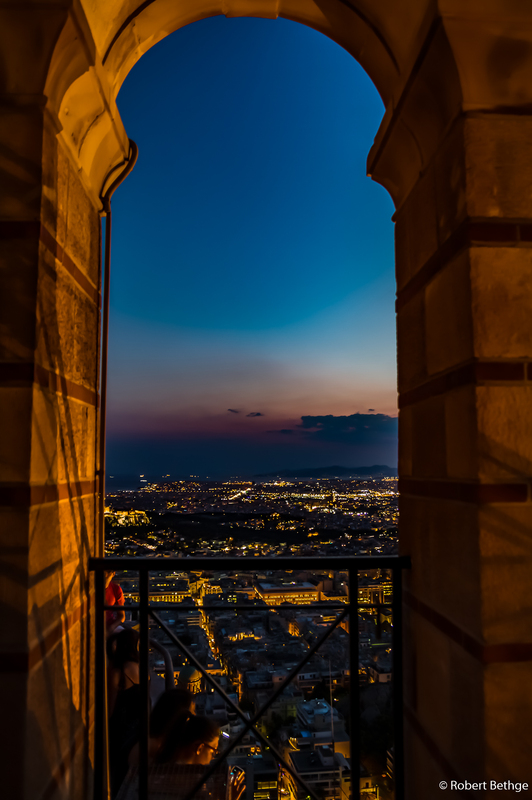 The best views of Athens, especially at night, you have from Mount Lycabettus, a steep, 300-m-tall limestone mountain right in the middle of Athens. Isn’t this a wolf behind that bush?! You can take it easy and catch the funicular railway that goes to the top, but I chose to go there and up the hard way: First I hiked from the Plaka district, where I was staying and where Akropolis is, to the base of the mountain, and after a little rest sipping an espresso and drinking a bottle of water that kindly was served with the coffee, I walked up the mountain. I must have picked the wrong path, because I went almost cross-country along some narrow, dusty gravel paths, which take you through some not so nice forest, used by locals to walk their dogs. The mountain according to popular myth used to be the refuge of wolves (lycos means wolves in Greek), which I had no problem believing while hiking through this strange forest. 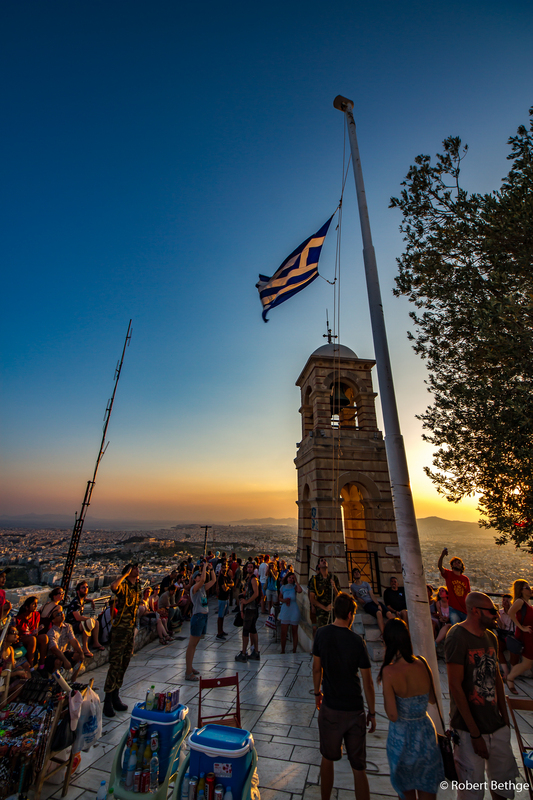 Anyway, I made it to the top eventually, and after a cool bottle of water, which vendors are happy to sell to you for 1 Euro, I started chatting with a nice American-Greek gal and her mom, who where in Greece to trace their family roots. I almost forgot to take pictures, so involved was I in our conversation, but when the sun finally set I recalled why I was actually here and started taking pictures. The sunset left some to be desired for, since a cloud pushed in front of the sun right before the sun disappeared behind the horizon. My goal was not really to take pictures of the sunset, but of the city lights during what’s called the “Blue Hour”, the hour right after sunset. 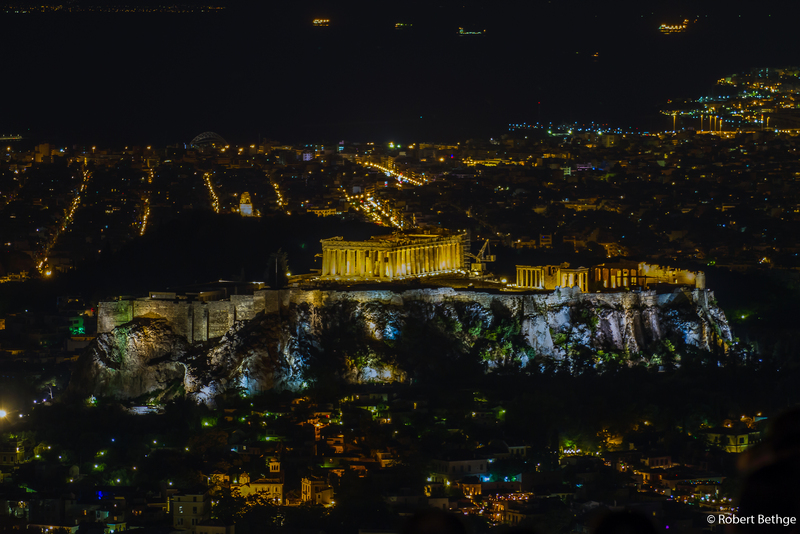 You can see Akropolis really beautifully from Mount Lycabettus, but to take frame-filling pictures of it, you have to have a strong tele zoom lens and a trip pod. Still, the strong winds rip quite powerfully at your camera, so taking sharp pictures of Akropolis from Mount Lycabettus can be a challenge. 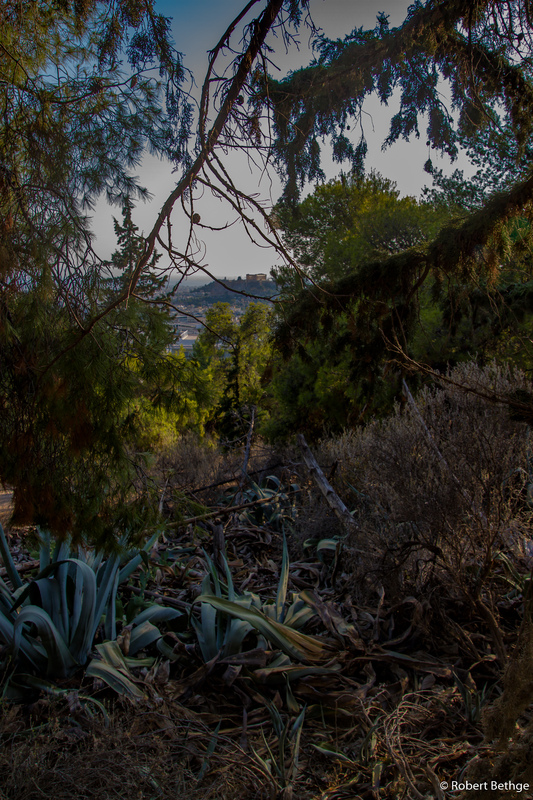 There is an open-air theater on the top of Mount Lycabettus, that had seen top acts like Gary Moore and Deep Purple. 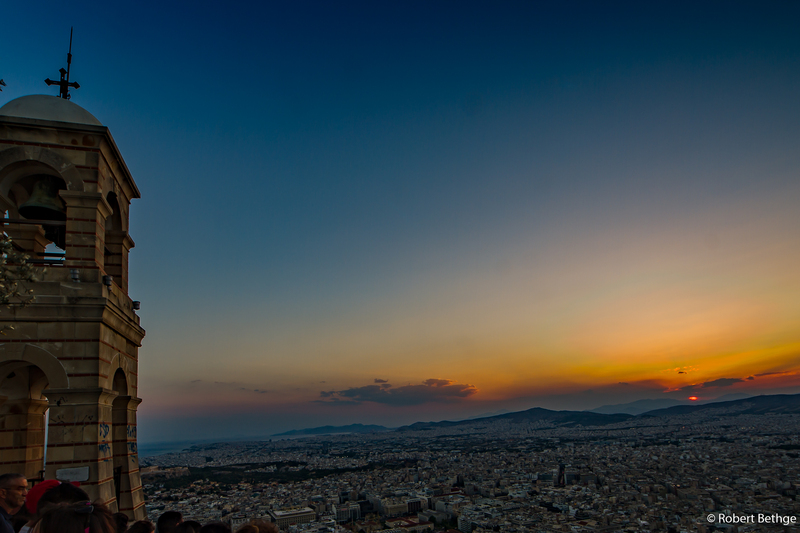 Also there is a small, charming church called Chapel of St. George, and restaurant that has marvelous views over Athens. The Greek-American gal told me that the restaurant is quite good, so if you want to treat your babe, take her there (but don’t take her through the Forest of the Wolves!). 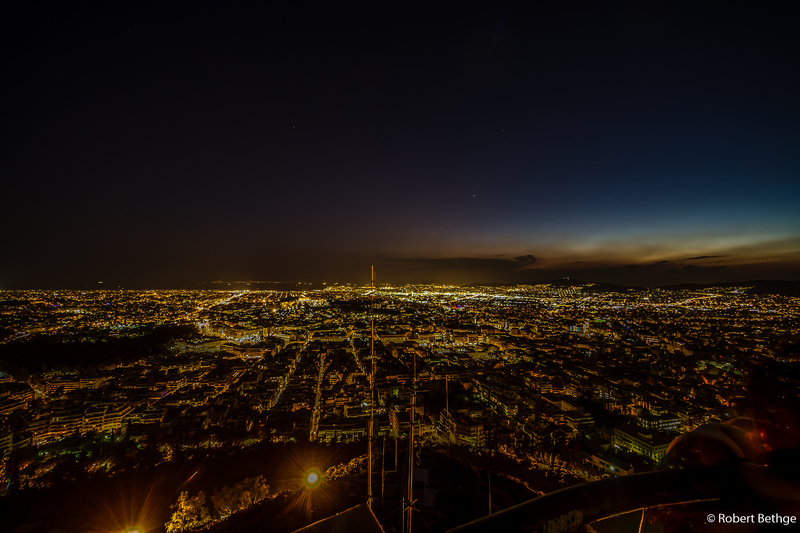 If you lake vast, unobstructed city lights views, you should not miss Mount Lycabettus.